Dermatologic surgeons performed nearly 10.5 million medically necessary and cosmetic procedures in 2016. The results of our annual procedures survey validate the level of expertise and care that ASDS members provide their patients. Dermatologic surgeons performed nearly 10.5 million medically necessary and cosmetic procedures in 2016 – five percent more than 2015 and up 31 percent since 2012. The results of the 2016 ASDS Survey on Dermatologic Procedures released today reveal a variety of trends including another increase in skin cancer treatments and continued growth in popularity of neuromodulators, soft-tissue fillers and body sculpting procedures. 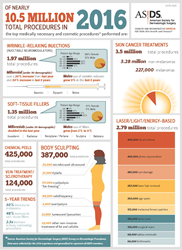 For the fifth year in a row, skin cancer treatments ranked as the most-performed procedure (3.5 million) by ASDS members, confirming both the growing incidence of the disease as well as demand for ASDS member expertise of its treatment. Since 2012, skin cancer treatments have risen 35 percent. Members also performed over seven million cosmetic treatments in 2016 — with the largest year-to-year growth seen in body sculpting (68 percent) and injectable neuromodulators (10 percent). 2.8 million procedures using laser, light and energy-based devices – Treats a variety of skin conditions including facial redness, excess hair, age spots, sun damage, scars and birthmarks. 1.7 million neuromodulators – Injectable wrinkle-relaxers to smooth fine lines on the face. 1.35 million soft-tissue fillers – Restores fullness to the face, plump lips and raise depressed scars. 425,000 chemical peels – A solution applied to the skin causing it to exfoliate and eventually peel off, revealing new, smoother skin. 387,000 body sculpting treatments – Procedures ranging from “fat-freezing” to injectables that help remove stubborn fat and tighten skin. In the last five years, the number of body contouring procedures has grown two and a half times. This growth is reflective of consumer concerns. Respondents to the 2016 ASDS Consumer Survey on Cosmetic Dermatologic Procedures indicated for the fourth year in a row that excess weight is their top cosmetic concern. Body sculpting treatments including cryolipolysis – commonly known as “fat-freezing” – rose over 76 percent just this year. Additionally, new procedures offer even more minimally invasive treatment options, such as Kybella, popular for fat below the chin, and microfocused ultrasound used for skin tightening. Within the growth of procedures performed, the male and millennial demographics’ interest in cosmetic treatments also continues to rise. In the last five years, men receiving wrinkle-relaxers has increased nine percent, and men using soft-tissue fillers grew from two to nine percent. Additionally, patients under 30 years old are seeking more cosmetic treatments. Millennials’ use of wrinkle-relaxers increased 20 percent from 2015 and 50 percent since 2012. The use of soft-tissue fillers for those under 30 years old doubled in 2016. This growth reflects the expanding interest in men wanting to look their best and younger consumers taking a proactive anti-aging approach to the health and beauty of their skin. As skin cancer rates continue to increase, dermatologic surgeons provide expert diagnosis and treatment while remaining committed to educating the public about prevention methods. Of the 3.5 million skin cancer procedures performed by ASDS members in 2016, 227,000 were for melanoma — a four percent increase from 2015. Treatments for non-melanoma skin cancers also increased 10 percent over last year. “ASDS members take a comprehensive approach toward the management and prevention of skin cancer, from offering patients treatment options to promoting sun-safe behaviors, community education and free skin cancer screenings,” Rohrer said. Data were collected for the 2016 experience and generalized to represent all ASDS members. The survey was conducted January 4, 2017, to February 8, 2017, for data reported in 2016. The survey link was sent to 3,853 practicing members. Survey results are reported based on 627 physicians, or a 16 percent response rate.